With the Nexus 4 selling out across Google Play and T-Mobile, many of you are stuck waiting, impatiently I’m guessing for their handsets to arrive. According to an XDA Developers thread there is some good news as Google is sending out a batch of emails to a number of people alerting them to another email set to arrive later this week. Why Google is sending out an email advising you of another email is beyond me, but if you’re waiting for your Nexus 4, this message may be of some comfort. Unfortunately, the exact date these phones will ship and/or arrive is unknown, but at this point we’ll take what we can get. “Your Nexus 4 order is scheduled to ship this week. We’ll send you a notification, including tracking information, when it’s on the way. Did you receive an email from Google today? I would love to know when they’re going to start accepting orders again…such a shame that Google and LG weren’t better prepared for this one. Noon PST today. Just got the email for Google. I got one of the first batch and it’s on EBay now. Plain android just isn’t for me. There are so many little things that I missed from Sense on my Sensation, like having native ability to speed dial. I know making phone calls is the lowest priority for the gen y folks, but hey, I’m weird that way. It is a very nice device but it didn’t care enough about it to spend the time to make it useable for me. Yes, speed dial and T9 dialer are sorely missed from Sense. Other than that, I love it. agreed. I tried dialer one, which has those features but I didn’t really like it. You should have tried CM dialer. I’m pretty sure you could get just that app and install it on stock Android. I think it would have curved your need for Sense. I didn’t even notice the speed dial feature on my sensation until I read this post. Between the contacts grouping and search, I do fine. why would you even order one? I didn’t know what didn’t know. I have never been a fan of pure Android. I think HTC sense makes Android a whole lot better. I have not tried pure Android in a while so I don’t know what has changed though. I have a sensation 4G- I have a nexus tablet with Jelly bean. My observations – 1) JB is much better than ICS. 2) JB has more features out of the box than HTC added in sense 3) I do NOT care for sense – everything therein can be accomplished in stock JB and much more 4) HTC may never offer any more updates to the sensation 4G 5) Google keeps offering updates and bug fixes almost every week ! All in all, I find that #5 is most important to me. Its been over a year and my phone only received one update so far from HTC. There are a lot of bugs in the s/w – none show stoppers but I am forced to reboot every other day to work around them. Even tmo’s service app recommends rebooting often. That is a serious inconvenience- bugs are an inconvenience. I need my phone to function when I want to use it. Nothing else with the phone matters as much. To profit on Ebay I’d assume. No, that’s not it. I actually tried to get it to one of XDA users who were in google play store limbo at my cost. Im definitely not a flipper. You’re a strange brew… Why would anyone care if a speed dialer is native or not verses pure unadulterated Android? ?—-and for an HTC device no less. I don’t know, man. Vanilla android probably isn’t the best choice for most people. If you’re into rooting and loading custom roms, sure, but as a standalone phone OS it’s pretty sparse. I know it can be made into whatever you like but some just don’t want to fool with that. And I like HTC devices just fine. HTC Sense Is pretty spoiling and full feature I understand your pain. Plain android misses alot of things that these UI makers incorporate but that gap is closing in to be honest. I’m with you there. I love my HTC devices. The downside is, of course, not getting the updates, but that’s partly why I switched to Windows Phone 8 with the 8X so it wouldn’t be as big of a problem. Still, Sense is one thing I will miss, even if you and I are in the minority. I’ve always had WP though. I’m a WP fangirl. I use to have a Sensation XE and I really miss Sense. I really miss FriendStream and the weather animations. The only reason why I sold it was becuz I got tired of HTC’s horrible battery life, and the Facebook app was just stupid as hell on Sense, it took like 5 mins to login each time and integrate with ur phone. Not to mention I got $460 for it becuz it was a rare edition and the buyer really wanted it. I have a S II and I’m already sick of it. I wanted the black One S, but I have a 32gb class 10 card with movies on it and there is no way in hell I will ever deal with a HTC phone when the battery is non-removable. I could prolly get over the no sd card slot, but the removable battery was a mega-deal breaker giving HTC’s weak battery history. For some reason, I am just not into the Nexus 4. Something about it makes me think it would be a total waste. Speed dialing thing is an easy fix by downloading a different dialer from the Play Store, most of them free. However, I do have to admit that I did not realize the convenience of all of the data integration that Sense does behind the scenes in its’ Contacts application. Having to download (and pay for) a separate app to sync Facebook information, with phone contacts is not something I had to even consider with Sense. On the other hand, I would rather pay the one-time $2.99 for the app, then have to ever again have to depend on HTC/T-Mobile to update my phone. For the first time since I pre-ordered my G1 over 5 years ago, my phone is running the latest version Android, within weeks of it being released, and I didn’t have to search the internet for it…I just clicked the notification that said I had a system update (from Google!) waiting to be installed. Well it’s good you were able to try it out, now ya know. Hope you get your money back you put into it. I was going to cancel luckily they sent me this. It would have been great to get a schedule of some sorts and day by day updates. Got my email and can’t wait to hold that bad boy in my hands. I woulda rather just get the message that it’s shipped, even better to just get a “it’s delivered” message. Off topic but… holy crap. 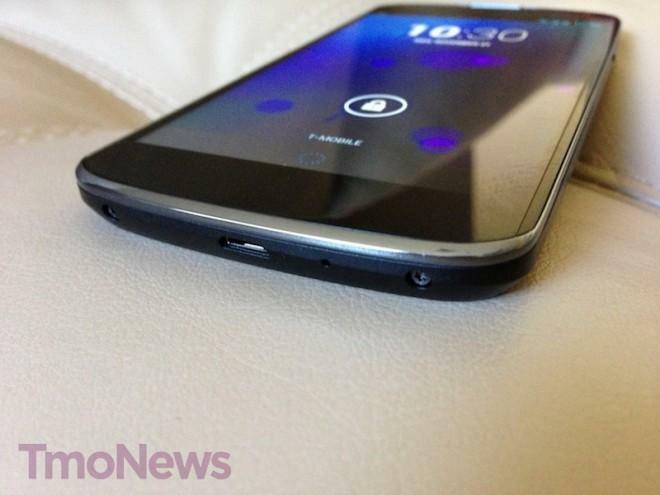 Look at the viewing angle of the Nexus 4 on the above image. Eck. I wonder if the delay is due to the missing month of December in the calendar. I’m still waiting to order it. i got one hope it comes in any new son our bumpers i ordered one but no news yet?? I did get that email around 6pm EST on Monday. I have not received anything from Google YET!! I singed in to Google play with my email to receive notification but have not gotten anything for the past month. This morning my Nexus 4 got another update to Jelly Bean 4.2.1 !!! I think this fixes some bugs.. Pure android FTW..
David, I Fwd and email from Google. NEXUS 4 IS BACK!!! I just got notification that I was supposed to get before the Nexus 4 Launch date to let me know it was available for sale. ONLY this email sayd it’ll be available for PURCHASE TODAY AT NOON – PST – US ONLY!!! For those who haven’t bought the phones….be ready at 3PM EST or 2PM CST!!! it’s not that serious lol … it’s just a phone. I got an email saying that orders will resume at 12PM PST today David .. for US Only. I hope they start selling bumpers again. I’m looking forward to that piece of mine when it’s finally shielded. My N4 has been unprotected way to long.